It’s been called the world’s sexiest fruit and it’s a darling of chefs, yet you may never have heard of it. So brace yourself for the taste of the 21st century: Yuzu, a rare and costly citrus fruit from Japan. 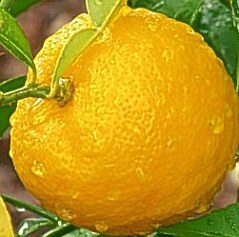 It tastes like a cross between a lemon, mandarin and grapefruit and is finally being accepted into Western cuisine, where it is being used to flavour everything from beer and chewing gum to vinegar and cocktails. This fruit is valued for its highly aromatic rind. The juice is minimal, thus often expensive. Yuzu is one of the few citrus in the world that is able to maintain its tart/sourness at high cooking temperatures. It smells so good the Japanese will use yuzu for perfumes and will ritualistically bath in yuzu during Toji (winter solstice). The zest is packed with delicious oils that allow you to use nearly every part of the yuzu in the kitchen. Jamie Oliver has a recipe for home-made Yuzu mayo (made of grapefruit if he can’t get hold of the real thing) to drizzle over grilled scallops, while Nigel Slater makes a Yuzu dressing for his crab and apple slaw. The East India Company has sourced Yuzu direct from Japan to use in a new range of fruit-infused chocolates. The company’s Manan Bhansali says: ‘Though it is a citrus, Yuzu is softer on the palate than lemon.’ The chocolatier William Curley also uses fresh Yuzu in his couture chocolate and cooks a Yuzu and Praline Tart. Yuzu adds a unique flavour to homemade chocolate ganache. Yuzu is an integral part of Japanese Ponzu sauce as well as yuzu-kosho, a spicy chili-salt laden with yuzu zest. Yuzu juice has a very strong flavour. It’s even more intense than lemon or lime juice, so when used in drinks, a little goes a very long way. Add a drop to cocktails — using it more like a bitter than a conventional fruit juice. It’s common to use yuzu in seafood seasoning, again used in similar situations to lemon or lime, but in smaller quantities. Just a single drop of yuzu juice might, for example, be used to dress an opened oyster, it could be incorporated it into a ceviche marinade, or added to a mayonnaise or brunoise. Also experiment mixing yuzu into savoury dressings and marinades along with soy, oil and garlic. Yuzu also has infinite applications in sweet recipes, where it is best used like an essence, or orange blossom water. Use a few drops to flavour custards, jellies, ices and meringues. Nuno Mendes uses a dash of yuzu in a panna cotta recipe, and also for flavouring tangy, jellied petit fours. Think of yuzu in a Japanese context alongside other traditional flavours like ginger, matcha, shochu and soy. The citric acidity means that yuzu works in similar scenarios to orange, lime and lemon — flavouring everything from marmalades to sorbets and light crab or fish dishes. The flower blossom notes provide an extra complexity, meaning that yuzu juice makes an interesting substitution for orange blossom water — working well alongside cinnamon, cloves, pistachio and rose. Mix all the ingredients. Strain seeds. Yuzu does not have much juice but the Japanese use the highly fragrant peel (also called the rind, or zest) in many ways. Wash fruit thoroughly and remove the stems. Place the fruit in a large saucepan with 2 litres of water. Boil the fruit whole for 1 hour if small or 2 hours if the fruit is large, until the skin is nice and soft. Use a slotted spoon to remove the fruit, saving the water. Add more water to make it up to 1.5 litres. Pre-cooking helps remove any bitterness. When the Yuzus are cool enough to handle, cut them in half and scoop everything out with a spoon, making sure there is no white pith left behind. Put all of the seeds and pulpy insides into a strainer over a bowl. Now slice or chop up the skins as thin or thick as you like and pop these back into the saucepan. Give the pulp a bit of a press down in the sieve and pour any of the juices from this into the saucepan as well. Add 1.5kg of sugar, or more or less according to your preference, and give it a good stir. Place the seeds and pulp into a muslin bag, tie it together and then submerge it into the liquid in the saucepan, hanging it over the side, tying the ends around the handle. Bring the mixture to a boil, taste a little bit from a spoon (be really careful as it is very hot) and see if it needs more sugar, if so, add as much as you need until it’s to your liking. Boil the marmalade rapidly for 20-30 minutes. While the mixture is boiling, wash your jars and lids and pop them onto a baking tray in the oven at 100c for 15 minutes to sterilze. Now place a normal crockery saucer into the freezer and let it get very cold. When the mixture has been cooking for 20-30 minutes, put a spoonful onto the cold saucer and pop it back into the freezer for 30 seconds. Take it out and push it with your finger, if it wrinkles up, it’s done. If not, continue to cook the marmalade for a further 10 minutes or until it does show signs of wrinkling. It doesn’t have to wrinkle and keep its shape, just enough so that you can see wrinkles forming. Turn the heat off and cool for 10 minutes. Remove the jars from the oven and place onto a wooden board or cool oven tray and use a soup ladle to pour the marmalade into the hot, sterilized jars then seal the lids while still hot. Leave to cool completely before storing. Makes 8 x 250ml jars. Wash the Yuzus, cut them in half and squeeze out the juice. Scoop out the seeds and white pith and set aside. Note: if you remove the white pith from the peel, it will be less bitter, but you can leave it if you like. Bring plenty of water to a boil. Soak Yuzu peel in the boiling water for 1-2 minutes. Throw away the water, bring fresh water to a boil and repeat. Do this 3 times in total. Leave the Yuzu peel in the final water for more than 3 hours to soak overnight. Drain the Yuzu peel well without squeezing it, and weigh. Slice as thinly as you like. If you cut it very fine, it will dry faster. Put the sliced peel and sugar in a pan, and leave for about an hour or two until the sugar has permeated the peel. Start cooking over a very low heat. Not a lot of moisture will come out at the start, so add 1 tablespoon of Yuzu juice. Skim off the scum. Simmer until there’s just some moisture left in the bottom of the pan. Cool, spread the peel on a tray or plate, sprinkle granulated sugar and leave to dry. Turn the peel over at least once a day, and sprinkle more granulated sugar. After a week it should contain almost no moisture. It will keep in the refrigerator for a good month. Candied peel at this stage is suited for dessert recipes. To use any extra juice: you can use Yuzu juice to make citrus vinegar. Just add an equal amount of vinegar and store it. It will keep for quite a long time. A clean, sterilised vinegar bottle is the best storage container. Peel the yellow skin off the 4 – 5 Yuzu fruits (about 500g) and discard the bitter white pith. Extract the juice from the fruit and save it. Finely julienne the peel (i.e. cut into extremely thin strips). Place the peel into a sterilized jar in layers, with the juice and 350g sugar. Set aside in a cool, dark place to mellow for 2 weeks. Ganache is very versatile – it can be used to fill pastries (e.g. a tart), used as the creamy centre for cupcakes or made into truffles. To make truffles, line chocolate moulds with tempered chocolate, then fill it with the ganache from a piping bag, and seal with tempered chocolate. Or use ganache as a cupcake topping. 1. In a pot, bring the cream and yuzu juice to a boil. 2. Pour the hot liquid into a bowl over the chopped white chocolate. 2. Using a wooden spoon, stir gently in one direction until the chocolate melts completely and turns into a smooth consistency. 3. The mixture can now be cooled in the refrigerator, and then rolled into balls to make truffles or cupcake centres, or eaten straight. Recipe by Janice Wong and Jonathan Sparber. Use a sharp, fine-bladed paring knife to trim away just the yellow part of the Yuzu skin, leaving the bitter white pith behind. On a baking tray, lay the strips skin-side down in a single layer. Let them dry in a reasonably warm room for 3-4 days, until they have shrivelled and are no longer moist. Slow drying retains more of the fragrant oils. Stir peels every day until dry and brittle. Store the dried peel in a dark place, in a clean jar. To use as a powder, either crumble it by hand or blitz it in a blender. You can use the powdered peel in place of extract in baking; in toppings, to flavour sugar-bowl sugar, in spice mixes (e.g. lemon, pepper, rosemary and sage), and to flavour sauces. Yuzu peel makes your bath water smell wonderful. Tie a small handful of dried (not powdered) peel into a small cheesecloth or muslin square, a thin cotton kitchen towel or a gauze handkerchief, and float it in the bathtub. The Japanese use whole Yuzu fruits in their most luxurious baths. Alternatively, slice fresh Yuzu and float it on top of the water.